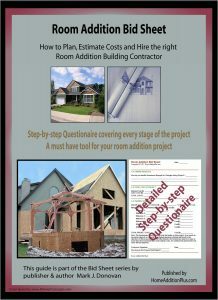 Mark Donovan of HomeAdditionPlus.com discusses a house addition checklist guide process. He provides a high level overview on the key steps required for kicking off and successfully undertaking a room addition project. The first step in any house addition checklist is to review the existing plot plans and covenants for the property. Key items to check for are any setbacks, easements, utilities, septic systems, and wells on the property that could impact your house addition plans. Another good idea is to visit your local building inspector to ask any questions you may have about your property and the ability to build a house addition on it. The second step in your house addition checklist is to sketch out the house and house addition on quad-ruled graph paper and to write down the key features you want to incorporate into it. The drawing should be to scale. Make sure to include in the drawings interior walls and expected furniture in the house addition. Next, convert the house addition sketches into formal plans using either a house design software package or having an architect design them for you. 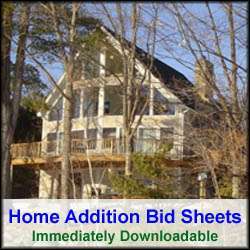 You’ll need these plans for soliciting contractor bids and for obtaining a building permit. With formal house addition plans in hand you can then begin the process of hiring a house addition contractor. Make sure you do thorough reference checks on any contractor you are serious about hiring. Hiring the wrong house addition contractor could turn your dream into a disaster with schedule slips and cost overruns. You may want to consider using a national database contractor referral company to locate qualified and pre-screened house addition contractors in your area. There is no cost to you for this service. One key litmus test to use when evaluating contractor bids is the level of detail in the bid. The more detailed the bid, the more likely the contractor’s bid reflects the projects true costs. Once you’ve decided upon a house addition contractor and know your costs, you can then pursue your finance options and pull a building permit. During the actual construction of the house addition make sure to check the status of the project at least every other day. If you’ve hired the right contractor and you’re disciplined in not making changes on the fly you should be able to have the project complete on time and budget, and to your original house addition plans. Make sure during the construction that either you or the general contractor calls for the required inspections by the building inspector. Not doing so could lead to expensive fines. When the house addition is complete also make sure to have the building inspector issue you an occupancy permit.